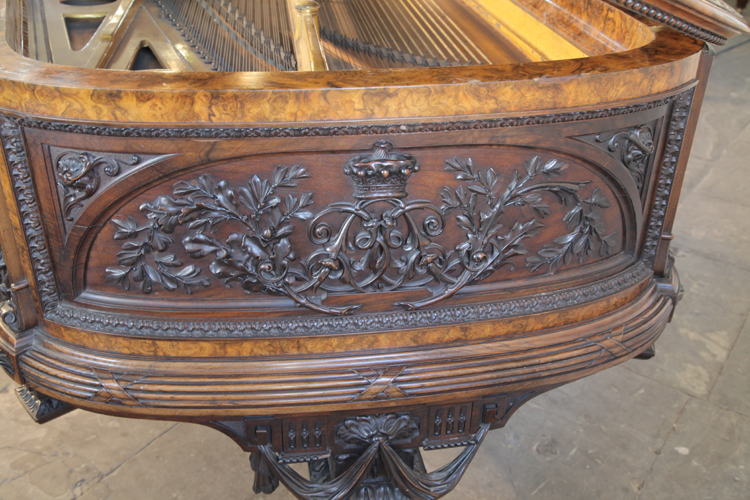 ﻿ The Breadalbane, 1869, Collard and Collard grand piano with an ornately carved, walnut case. 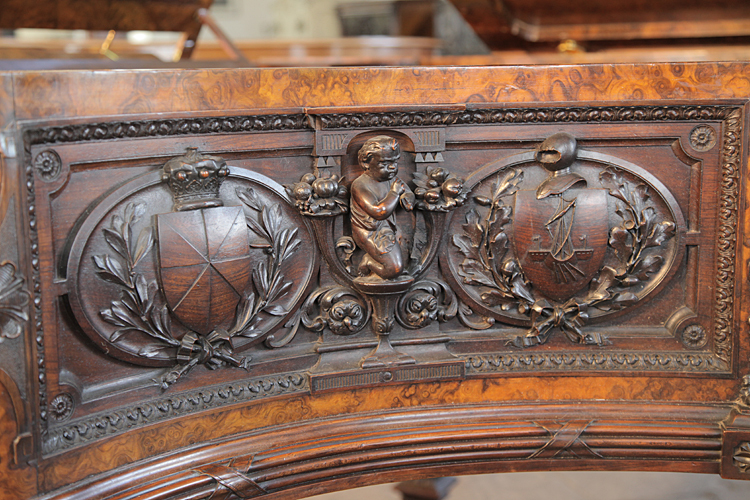 Cabinet features heraldic imagery from the Campbell Clan alongside Neo-classical motifs. 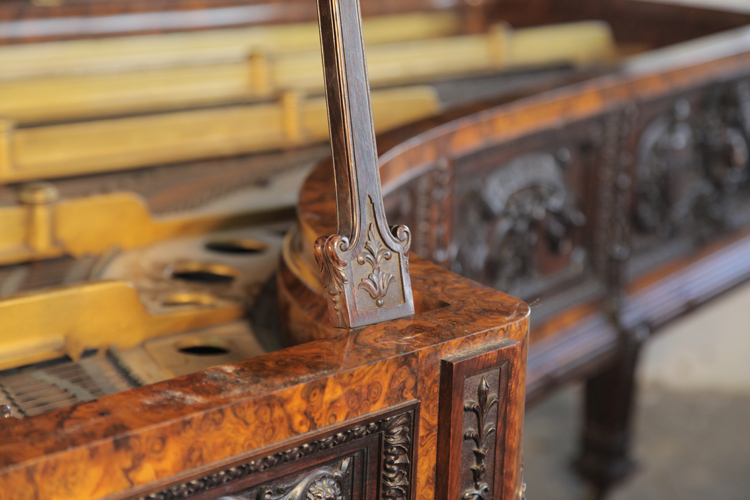 The Breadalbane, 1869, Collard and Collard grand piano with an ornately carved, walnut case. 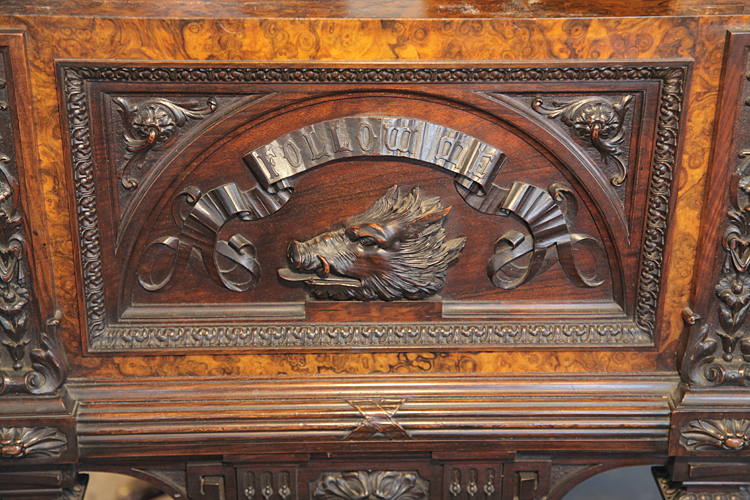 Cabinet features heraldic imagery from the Campbell Clan alongside Neo-classical motifs. 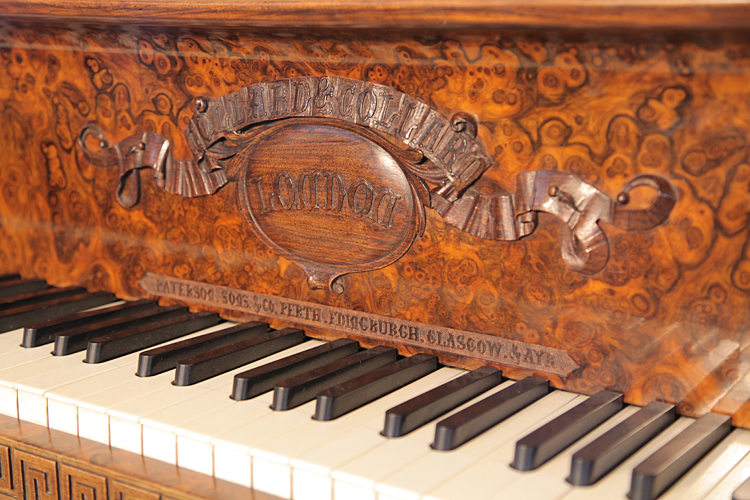 This piano was commissioned by the 6th Earl of Breadalbane and Holland, in May 1868, as a gift for his daughter Lady Eva Campbell, to celebrate J A G Campbell's accession to the title in 1862. 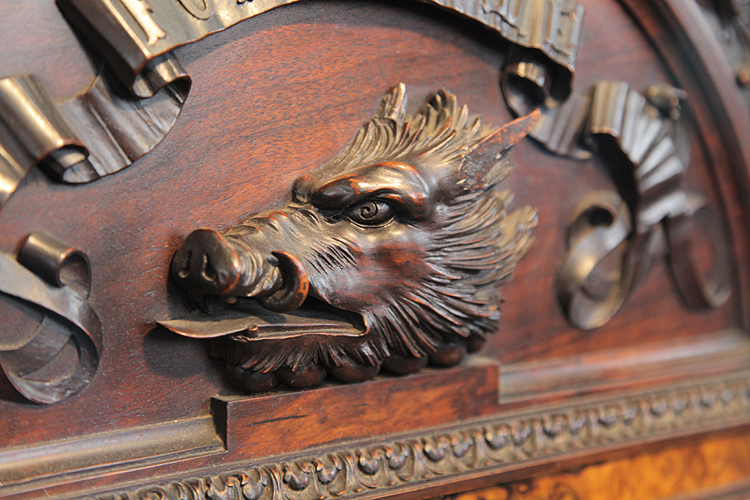 It took two years to craft the incredible carvings that adorn the case. Exploring the ornatley carved features, there are three sets of his children's initials, a boar's head which makes up part of the coat-of-arms of the Campbell Clan of Breadalbane, A pierced heart with an arrow which is part of the coat of arms of Campbell of Glenfalloch, Bog myrtle, the plant badge of the clan is also represented. The lyre features two griffins guarding a central urn. Cherubs playing musical instruments sit in high relief amidst coats-of-arms. 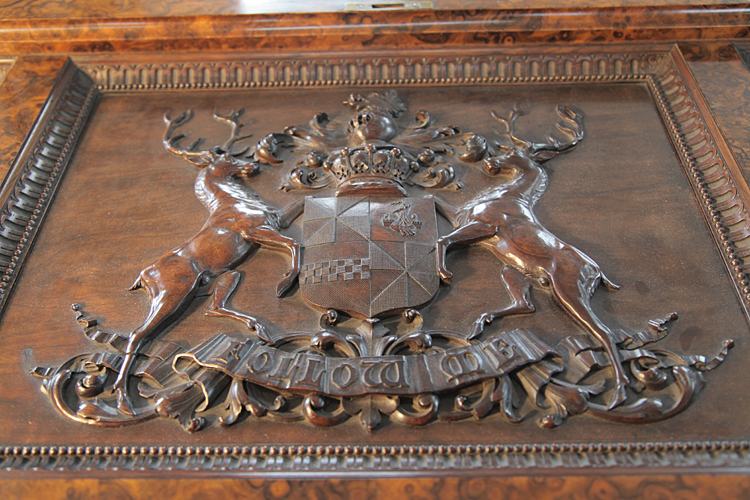 Rearing stags flank another coat-of-arms topped with a crown. 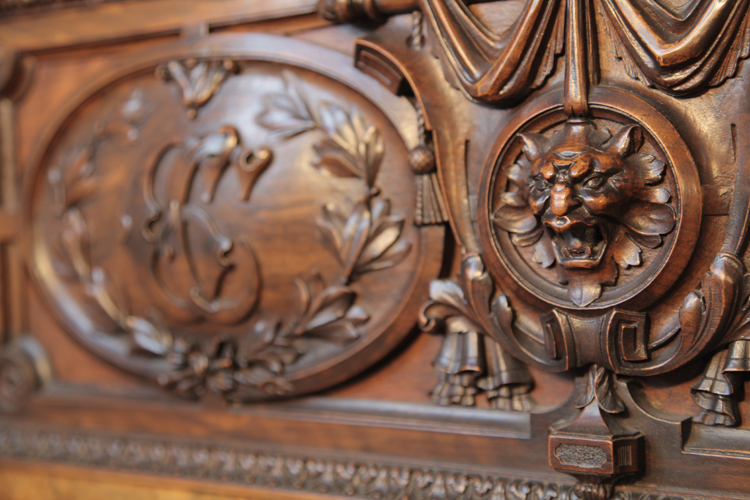 The carved detail around the entire cabinet is simply stunning. 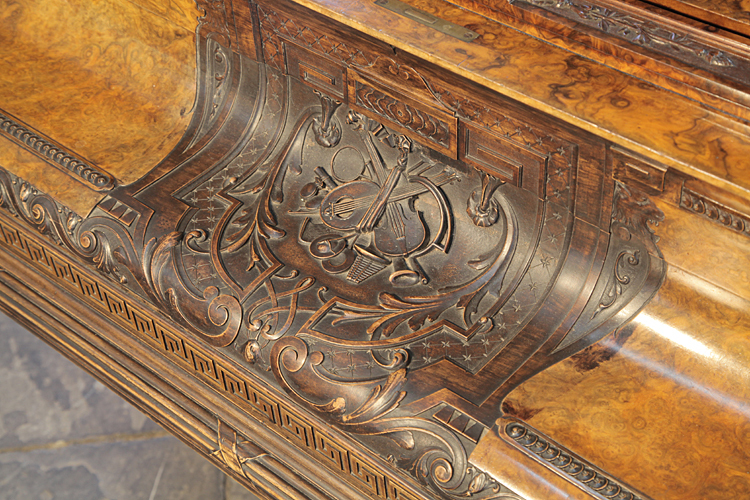 In 1868 the piano cost £2000 to make, half of which accounted for the carvings alone. The instrument is in original condition. It is no longer possible to tune it fully up to pitch as in its present condition, the sound board is too weak. 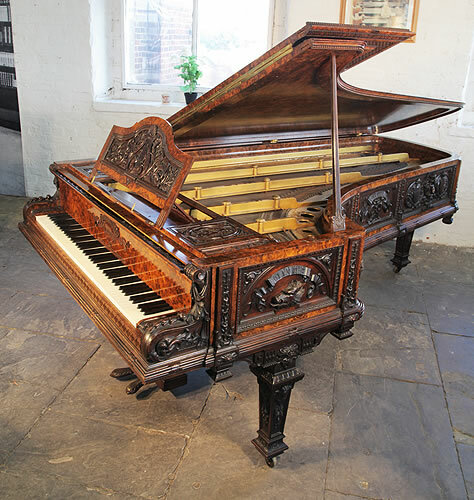 Ref 2147: The Breadalbane, 1869, Collard and Collard grand piano with an ornately carved, walnut case. 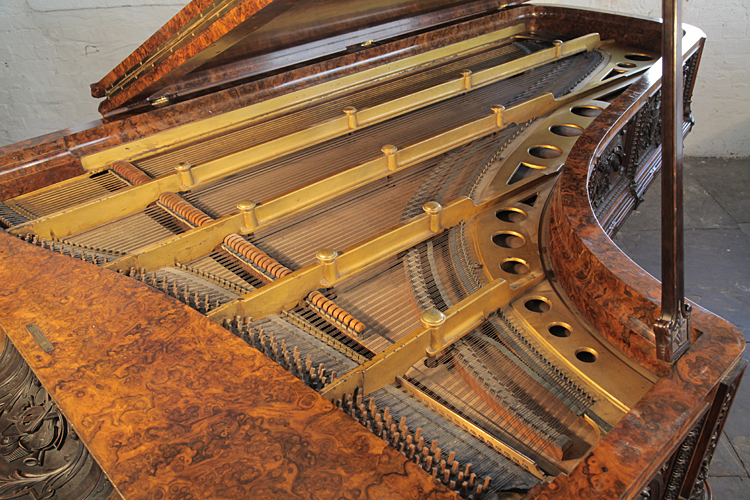 Collard and Collard piano lidstay. 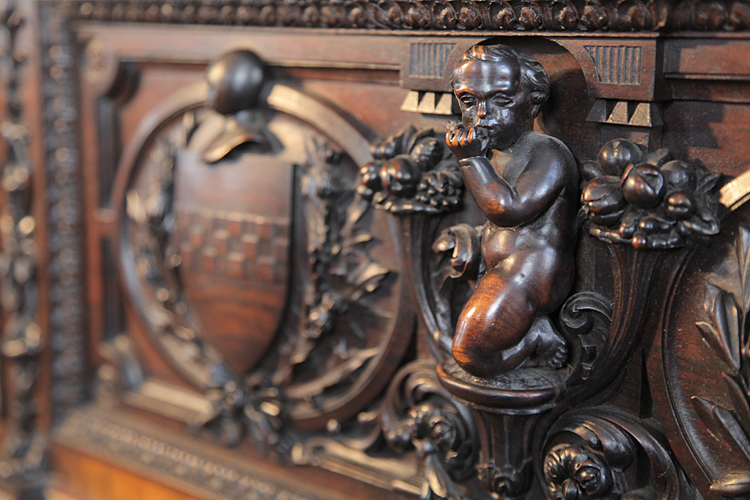 Collard and Collard piano cabinet detail featuring two shields and a cherub. The left shield is divided into eight gyrons by straight lines all crossing at the fess point. This is from the Campbell coat-of-arms and would be coloured gold and black. The right shield has a carved galley with rowing oars. This too was embematic from the Earl Of Argyle's Campbell coat-of-arms. The cherub sits playing a musical instrument amongst cornucopia. The boar's head is the crest badge of the Campbells of Breadalbane, also called the Glen Orchy Campbells with the motto, Follow Me. 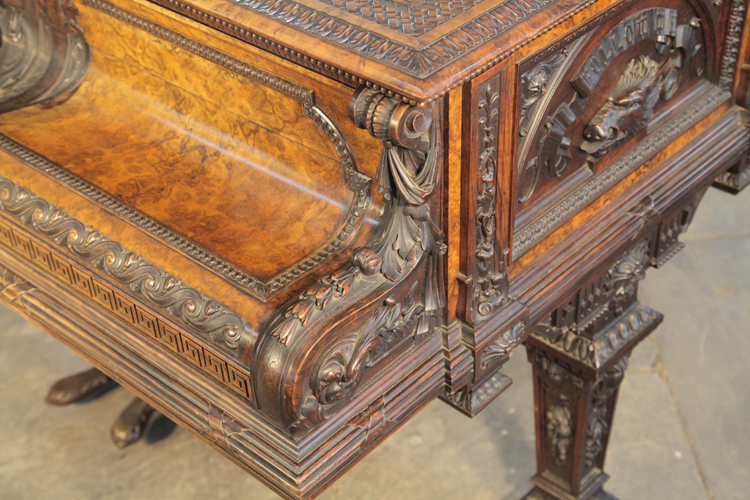 Collard and Collard piano cabinet back panel detail. Here oak leaves and bog myrtle twist in sinuous lines with a central crown. 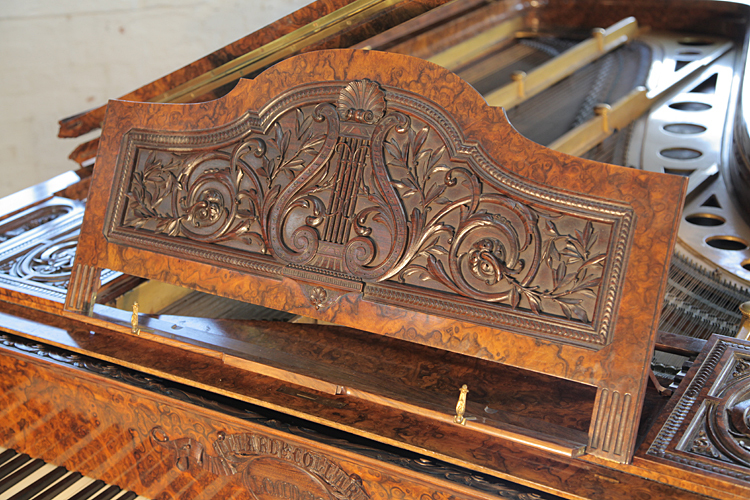 Collard and Collard piano fall carved with musical instruments and scrolling arabesques. 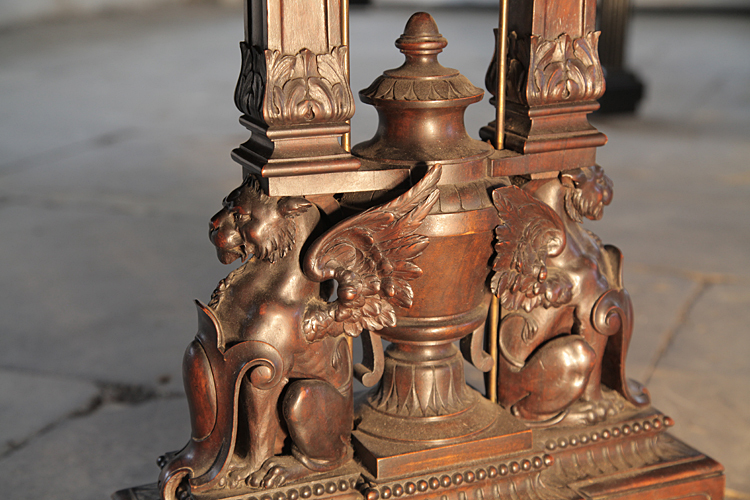 Collard and Collard piano lyre with a central carved urn flanked by two griffins. Collard and Collard piano carved gargoyle's head detail. 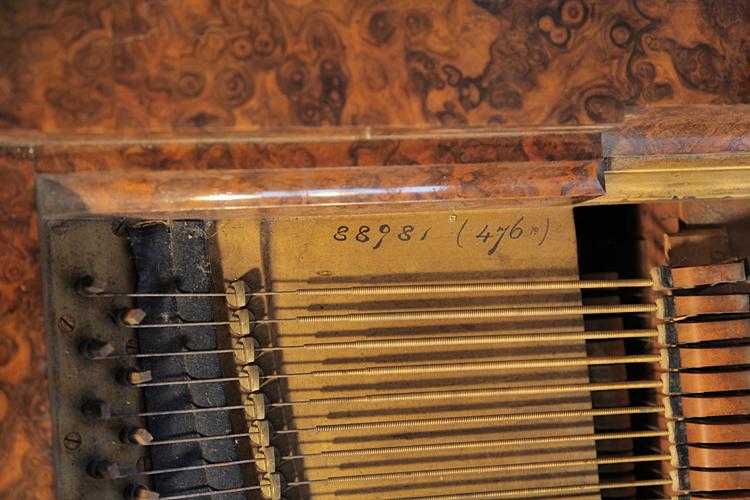 Collard and Collard piano cheek detail. 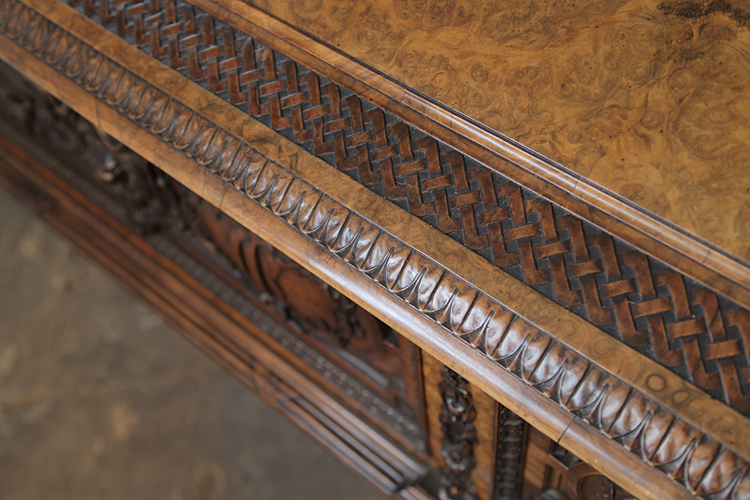 Collard and Collard piano lid is finished with a woven celtic knot carving. Collard and Collard unrestored instrument.